The BARTEC BCS370EX has been discontinued. No direct replacement is available. 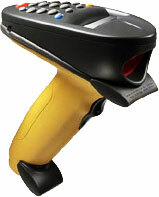 The new Bartec radio handheld scanner BCS370EX offers all ergonomic characteristics and technical features which are currently required in industrial applications. Thanks to the "Intrinsic Safety" degree of protection, it can be directly used in ex areas of zone 1. Via a serial receiving cradle, a comfortable system integration can be realized. The stable BCS370EX radio handheld scanner is excellently suitable for use in industrial environments as the mobility and workflow are not impaired by a disturbing and wear-sensitive cable. Unhindered working is possible within a radio range of up to 30 meters from the receiving cradle.